Microsoft unveiled a new service last May 28. I heard about it from a friend last weekend, and he said he was going to give it a whirl when it's launched. He was all excited about it, and so I decided to take a look myself. 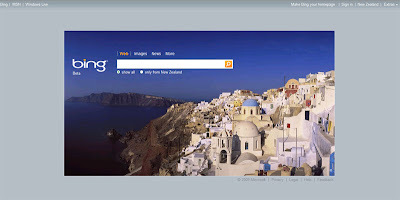 Microsoft has launched Bing.com, a Decision Engine. They call it a Decision Engine because it is designed to help you... um... decide. Touted as more than just a search engine, this service is designed to focus initially on four vertical areas: making a purchase decision, planning a trip, researching a health condition, and finding a local business. In essence it will more than just provide you search engine results, but it will also intuitively go beyond giving internet facts by, for example, displaying the best rates possible for a hotel booking, or help you decide when and where you can get the cheapest plane fare. Bing.com's interface is simple enough; it reminded me of Ask.com, actually. And there was no apparent link to what it was all about, and so I had to Google about it. Hmm... the Bing Travel sounds intriguing, though. Will check that out.